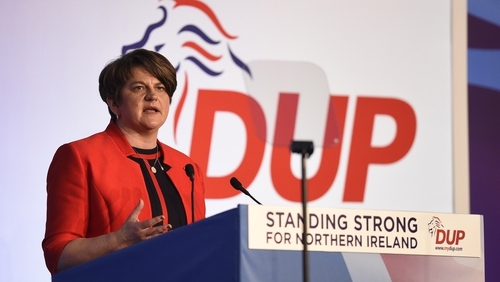 DUP leader Arlene Foster has acknowledged the concerns of Northern Ireland's business community over a no-deal Brexit, but said the deal currently on the table would not be in the North's long term economic interest. Ms Foster also rejected what she described as the "spin" by the British government on the issue, saying the draft withdrawal agreement due to be discussed by EU leaders in Brussels is not the only alternative to a no-deal Brexit. "I know that there are many in the business community in Northern Ireland who are frustrated with the pace of negotiations and the politics around it and who simply seek certainty. I understand their position," she said. "They have been clear that they would prefer what is currently on the table rather than a no-deal outcome. "But for us we cannot wish away the fact that the draft withdrawal agreement contains arrangements that we believe are not in Northern Ireland's long term economic or strategic interests." Under the draft deal which contains a backstop arrangement, Northern Ireland would remain part of the EU's customs code which, Ms Foster said, would mean it would inevitably diverge from its largest market - the rest of the UK. "The choice is not between this deal and no deal despite what the government spin machine may say," she said. "The reality is that if we are to secure a better outcome than is currently on offer then the only option is to look beyond this current draft withdrawal agreement and work in the time ahead for an improved outcome." Ms Foster - who earlier warned that her party's arrangement to prop up British Prime Minister Theresa May's Government would be at risk if the current Brexit deal is passed - told her party conference that the DUP "has never been afraid to say yes when it is the right thing to do." She said: "We are not campaigning for a no-deal exit nor do we want barriers to trade between Northern Ireland and our neighbours in the Republic. "This party acted responsibly in the national interest to secure a government in 2017 and we will not be found wanting in our efforts to secure a better outcome." The former first minister insisted her party was committed to the restoration of the crisis-hit Stormont executive. She said she wanted all the main parties involved in efforts to revive powersharing. Ms Foster also apologised for the DUP's handling of the Renewable Heat Incentive Scheme which she said marked a difficult period for her party and "for Northern Ireland politics as a whole." "We are deeply, deeply sorry for the mistakes we made, and for the things we got wrong during that period." Brexit and the DUP: Triumph or disaster? She said she was determined that her party will learn lessons from the controversy around the scheme and "how government business was conducted at Stormont more generally." Ms Foster said there are "many lessons" to learn and it will result in an "ongoing process of renewal and self-examination" in the DUP. A public inquiry into the scheme has been "difficult for many individually and painful for the party collectively," she said. "No party would want to have all of its dealings exposed for all to see at a public inquiry, especially in the unique system of government we have, with the struggles and strains required to make it work. But I make no excuses." "I know I speak for many when I say that over the course of the last twelve months there have been a number of other areas where behavior in our ranks has not matched the standards expected of people holding public office"
"We must ensure there is no repeat of such behavior." Earlier, DUP deputy leader Nigel Dodds told Prime Minister Theresa May that it is not too late to "bin" her Brexit deal and the Northern Irish backstop arrangement. Mr Dodds used his speech at the DUP conference in Belfast to urge Mrs May to change course, warning that the proposed withdrawal agreement would see the UK assume a "pitiful and pathetic place". Mr Dodds insisted the union of Great Britain and Northern Ireland was "non negotiable". "It is still not too late for the Prime Minister to change course," he said. "Don't believe the propaganda that it's too late - it isn't. The DUP wants a deal with the European Union, we understand that businesses, families and communities want certainty. "But it is not this deal. It is not a deal at any price. The Prime Minister used to say that. We still say that. So Prime Minister, the message from this conference, from every section of this party is - bin the backstop." Conservative Party MP Boris Johnson said it is time to "junk the backstop" from the Brexit deal which is due to be agreed between EU leaders in Brussels tomorrow. Addressing the DUP party conference in Belfast, the former foreign secretary said the UK was "on the verge of making a historic mistake" if it accepts the withdrawal agreement when it goes to a vote in parliament. He warned that Northern Ireland will be used as a bargaining chip in the next round of negotiations and said the issue of the border should "be remitted to the discussions on the future economic partnership where it properly belongs." "Unless we junk this backstop, we will find that Brussels has got us exactly where they want us – a satellite state. We will continue to accept the terms under which they have a surplus in trade in goods with us of £95 billion, but with no power to influence those terms," he said. "Because they have done a very clever trick, they have made Northern Ireland their indispensable bargaining chip in the next round of negotiations." Mr Johnson also called for the appointment of a government minister to deal with a no-deal Brexit. He said he did not believe Britain will leave the EU without a deal but said it would be responsible to make the proper preparations. "We need a secretary of state for a no deal or WTO terms who would have real powers across Whitehall to make things happen," he said. He also reiterated his call for a bridge between Northern Ireland and Scotland, saying it would be a "far shorter distance than that covered by some bridges these days." He said this was an "admirable suggestion" and the problem was not the lack of funds, but the lack of political will."